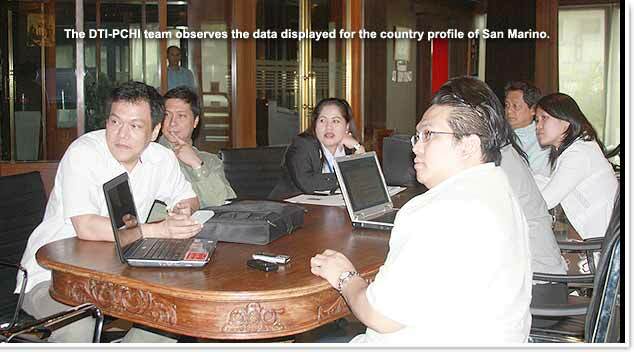 February 3, 2009--The Consulate General Office of San Marino briefed the members of the Philippine Chamber of Handiwork Industry who were set to leave for Europe for a trade mission from February 18 to 19. The team is scheduled to conduct an outbound business mission in coordination with the Bureau of Export Trade Promotion-Department of Trade and Industry, the Philippine Chamber of Handiwork Industry and the Trade Office of the Philippines in Italy. The team will also meet with the Chamber of Commerce of San Marino to discuss possible business partnerships from both countries. This trade mission is the very first attempt from the two countries to establish possible business cooperation in the field of handiworks such as accessories, tourist items and houseware goods. The briefing discussed the requested information about San Marino from the Consulate such as the country profile, the trade potential and the cultural notes. A short discourse followed after the end of the briefing. A tour of the Consulate General office premises was also done to add more to the visitors’ knowledge of San Marino and her products. To aid the team about San Marino, brochures that contained helpful visitor information were also given away as a parting token to the departing team. Part of the Summit program was a presentation about the “Ten Things That You Should Know about San Marino” and an interactive game co-facilitated with the Summit organizers. The winners of the 10 questions based from the San Marino presentation were awarded with commemorative mugs, pins and paperweights as prizes. San Marino wines were given as token to the distinguished speakers.